FAYETTEVILLE, N.C. — In the wake of the Sept. 11, 2001 terrorist attacks, there were three key stories that described the resolve of the American people, according to retired Lt. Gen. John F. Mulholland. In 2001, Mulholland was a colonel who had recently taken command of the 5th Special Forces Group. Within days of the Sept. 11 attacks, he would be helping plan the initial push into Afghanistan, a mission that would topple the Taliban in a few months and, in doing so, give new life and support to the nation’s Special Forces, who were ill-equipped and not fully supported before the start of the war in Afghanistan. The biggest challenge in those early days, Mulholland said, was finding the right soldiers to deploy for the mission. And it just so happened that some of those soldiers were among the last to learn of the attacks. 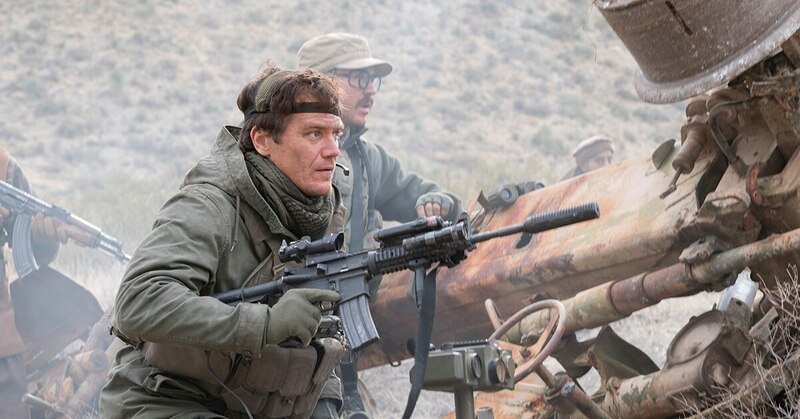 Retired Chief Warrant Officer 4 Bob Pennington, who is depicted by Oscar nominee Michael Shannon in “12 Strong,” said most of his Special Forces team, Operational Detachment-Alpha 595, were on an overnight training mission near Nashville, Tennessee when the planes hit the World Trade Center. The night before, the soldiers had used three zodiac boats to take another team of Special Forces soldiers to a designated position to attack a training target along the Cumberland River. The trip was several hours amid a thick fog. “It was about as thick as pea soup,” Pennington, then a chief warrant officer 2, said. After almost colliding with a barge, the team decided to camp along the bank of the river and wait for morning. They were unaware of the attacks on Sept. 11, until they began to pack away their gear and heard the news on the radio. As the team made a beeline for its home base at Fort Campbell, Kentucky, then-Capt. Mark Nutsch was still piecing together what had happened. Nutsch, who is portrayed by the film’s star, Chris Hemsworth, in “12 Strong,” had recently been assigned away from ODA 595. He joined the battalion staff on Sept. 10, 2001, after having led the ODA for two years, including missions to Uzbekistan and Kuwait. Marines call in first A-10 strikes in Helmand province, striking a Taliban machine gun position. On the morning of Sept. 11, 2001, he was home with his wife — then six months pregnant — and their two boys, then ages 4 and 3. At first, Nutsch wasn’t sure what he was watching on his television. Meanwhile, Pennington and the remaining members of ODA 595 arrived at Fort Campbell to find miles of cars waiting to enter the post. They cut around the line and tried to make their way into the installation before being stopped by armed guards. Pennington said the men explained that they were Special Forces soldiers and needed to find out what was happening. Hours later, Pennington said, he finally was home, where his wife, Michelle, was waiting for him. “I said, ‘Of course,‘” he told his wife. ODA 595 learned it would be among the first in Afghanistan on Sept. 14, although it would be almost a month and at least three false starts before the deployment. Pennington said the first priority was putting the team back together. And that meant bringing Nutsch back into the fold. ODA 595 was a natural choice for the mission - a mature, experienced team that had recently worked with special operations forces in Uzbekistan, a northern neighbor to Afghanistan. On average, the 12 members of the team were 32 years-old, had eight years of experience and had been working together for two years. Many, including Pennington, had combat experience, whether in Desert Storm, Somalia or Kosovo. They were family men. All but one was married. And 10 of the 12 had at least two children. At first, the soldiers prepared for a personnel recovery mission. Once the air war in Afghanistan began, the team would be tasked with retrieving any pilots shot down in enemy territory. As they trained, the team fielded new equipment and learned as it could about Afghanistan. In those days, Nutsch said, there wasn’t much, if any, official material on the country. The soldiers read anything they could find in magazines. And without military maps, they resorted to using tourist maps of the country. In a matter of days, the soldiers soaked up as much information as they could on a conflict that has raged for more than 100 years, with ethnic factions continuously at war in Afghanistan. They read whatever they could find on those factions, trying to determine if any of them could become partners. As ODA 595 prepared for its mission, senior leaders with the 5th Special Forces Group routinely disappeared for Florida, where officials with U.S. Central Command and U.S. Special Operations Command were planning the initial invasion. “We knew time would be of the essence,” Mulholland said. And leaders were pushing hard on Washington to give the green light to send troops into Afghanistan. Those teams would deploy with much less information than any troops would today, the retired general said. But they had little option in 2001. For the first few months of his command, he was constantly lobbying for more money to support his soldiers. At the same time, he was trying to learn the strengths and weaknesses of his teams. In the days following Sept. 11, 2001, Mulholland said the challenge came with the unknown. He knew 5th Group, which was historically aligned with the Middle East, would likely have a role in the coming fight. But there was not much information available on Afghanistan or what his soldiers could expect. That changed once Mulholland got linked in with officials at the CIA, which would be the first to deploy clandestine teams into Afghanistan and would work alongside Special Forces in the country. Mulholland said the CIA made recommendations as to which ethnic leaders — in some cases the title was more akin to warlord — Special Forces teams should work with. On Oct. 5, 2001, ODA 595 finally left Kentucky. The team transferred planes several times before finally landing at Karshi-Khanabad Air Base in Uzbekistan, at what was then a secret base. In “12 Strong,” the base, also known as K2, is depicted as a tent city of sorts, definitely a more modern set up than what ODA 595 discovered as one of the first groups of troops to arrive on the ground. At that time, the base was little more than a series of Soviet-era bunkers. At K2, the ODA received new orders. It would no longer have the personnel recovery mission. Instead, it would be tasked with something entirely different. For the first time in the then-roughly 50-year history of Special Forces, the soldiers would be asked to lead an actual unconventional warfare campaign, partnering with indigenous forces to take down a government. By this time, Mulholland and other 5th Group leaders were in Uzbekistan. But answers to the ODA’s questions were still scarce. At first, four teams, including ODA 595, were marked to be the first to go into the country. Mulholland later would take one of those teams off the mission because of a lack of confidence in the team. On Oct. 19, after several weather delays, the first two teams — ODA 595 and ODA 555 — flew into Afghanistan on MH-47 helicopters. ODA 555 was dropped off to the east of the country, where it would work with ethnic Tajik fighters. ODA 595 was inserted about a 100 miles of the city of Mazar-i-Sharif, where it linked up with ethnic Uzbek fighters under Gen. Abdul Rashid Dostum. Dostum, a former Communist general, was a key figure in the Northern Alliance against the Taliban. Eventually, he would become a vice president after the fall of the Taliban. But in 2001, Dostum still was very much a wild card in the war, as were many of the other leaders that Special Forces teams worked with in the earliest days of the conflict. Some, including Dostum, had bloody reputations. He also was known for switching sides over the course of several conflicts within Afghanistan. And Mulholland was sending Americans into his midst. There was little assurance that the Special Forces soldiers would be safe with the Afghan fighters. And if they weren’t, there was little anyone would be able to do to help them. There were no geographical limitations, he said. If Dostum wanted to march on Kabul, the Americans would join them. ODA 595 was to support Dostum’s forces, but at the same time, the soldiers were assessing the Afghan fighters’ equipment and capabilities to aid the deployments of future Special Forces teams and help plan the war effort. Officials didn’t know much about the fighters. They would find, much to their surprise, that Dostum’s army still used a horse cavalry. In many ways, it was a 19th Century military using 20th Century weapons. When ODA 595 arrived, it added 21st Century technology and the full force of the U.S. military’s advanced weapons and devastating air power. Nutsch, who grew up on a cattle ranch, quickly had to teach others on the team how to ride. The ODA carried a piece of steel from the World Trade Center into Afghanistan. Pennington said some were thinking of payback as they flew into the country. But he was focused on doing the job, and having everyone come home alive. But Pennington said the team was confident. And they knew what needed to be done. If they could help Dostum capture Mazar-i-Sharif, that would open a beachhead into the rest of the country. But first, they had to earn Dostum’s trust. The Afghan leader believed that American support would disappear if one of the Special Forces soldiers was killed or seriously wounded. He famously said he would rather have 500 of his own men killed than have one of the Americans scratched. ODA 595 convinced him that 9/11 had changed things, that America was all-in on overthrowing the Taliban. And gradually, he allowed the Americans to move closer and closer to the front lines. Mulholland said ODA 595 helped lay the groundwork for something special — an overwhelming defeat of the Taliban in just a few months. But it’s also only half of the story. The other half takes place in communities such as Fayetteville, outside Fort Bragg, and Clarksville, Tennessee, outside of Fort Campbell. There, families of special operations troops still are saying goodbye to their soldiers, 16 years after the first Green Berets arrived in Afghanistan. The support of those families, and those communities, is what makes the deployments possible, Mulholland said.